• 82% of respondents said their loved one with an SUD experienced adverse financial effects due to their addiction. • Eight in ten agreed that regaining control of one’s finances is one of the biggest challenges for those in recovery. Troubles with money often persist long after substance use stops. Eight in ten adults who have a loved one with an SUD agree that regaining control of one’s finances is one of the biggest obstacles in recovery. Having ready access to money makes it easier to relapse in a moment of temptation. 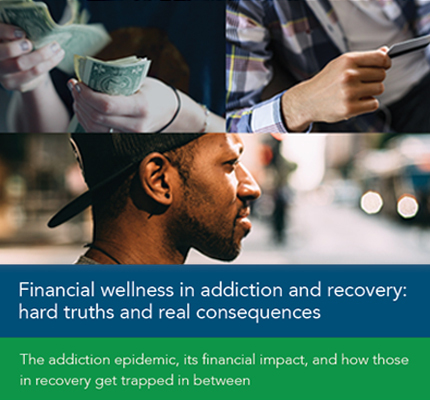 However, removing access to money is also an impediment to recovery – by making it harder to build a positive, sober life that many specialists cite as a key to recovery.³ “Certainly addiction affects someone’s finances. Being in control over money is an essential part of recovery,” says Dr. Daniel Bober, Medical Director at Lifeskills South Florida. One medical director at a sober living facility told a story in which a resident was saved from a relapse as a result of not carrying cash: “[Albert] admitted he was having cravings but assured us, ‘I’m fine. It’s good.’” Two days later, he was walking home to the sober living residence after an intense therapy session off-site when someone he passed on the street offered him the chance to buy drugs. Without cash in his pockets, he couldn’t make the purchase. 1. CDC, 2016. Underlying Cause of Death, 1999-2016. 2. True Link national survey of 341 Americans aged 18+ conducted online using SurveyMonkey Audience panel and fielded August 26-27th, 2018. 4. Gramlich, John. “As fatal overdoses rise, many Americans see drug addiction as a major problem in their community.” Pew Research, 2018. True Link is a San Francisco-based company committed to increasing the independence and financial well-being of older adults, people with disabilities, and people recovering from addiction. The company offers payment cards, investment management, and other financial services. Founded in 2012, True Link serves clients in all 50 states.